The Archaeocyaths are an extinct group of sponges that have a controversial history. Discoveries in the 1960s and 1970s caused re-examination of sponge phylogeny generally, and comparisons between archaeocyaths and sponges in particular. The result was the abandonment of the Phylum Archaeocyatha. Present consensus is that archaeocyaths represent both a clade and a grade--Class Archaeocyatha and the archaeocyathan morphological grade--within Phylum Porifera. The first archaeocyaths appear roughly 530 million years ago, during the Lower Cambrian and were very important members of Lower Cambrian environments. They diversified into hundreds of species during this time period and some of these species contributed greatly to the creation of the reef systems that supported a wide variety of organisms. Despite their great success in terms of numbers, the archaeocyaths were a short-lived group. They were almost completely non-existent by the middle Cambrian, some 10 to 15 million years after their first appearance. The first multi-celled animals (metazoa) evolved over 600 million years ago and can be grouped into three categories: sponge-like animals, cnidarians, and worms. The sponges, and cnidarians (corals and sea anemones), are the most primitive with about 11 specialized cell types. Worms and higher metazoa have approximately 55 specialized cells. 1) Sponges are simple multi-celled animals. In general, sponges have open-topped, sack-like bodies which are fixed to the sea floor. Water is pulled through the body, and food is filtered out. 2) Cnidarians comprise corals, sea anemones, and jellyfish.Their body plan resembles a sack with an end that functions as a mouth that can be opened and closed with tentacles that can be extended to move food to the mouth. 3) Among the simple metazoa, worms are the most advanced, and it is conjectures that their body was the basis for the evolution of all more advanced life forms. Worms have a fluid-filled cavity called a coelom inside the body and advanced variations of this cavity can be seen in all higher animals. In many animals, it has become the sack which holds the internal organs. The earliest known insects are tiny wingless forms from the early and middle Devonian. Insect flight developed with suddenness resembling the Cambrian explosion during the middle Carboniferous, apparently the result of the significant survival advantage that was accrued. By the end of the Carboniferous, the insects had evolved into a large number of distinct orders, including many dragonfly-like forms. This was the hey-day of the Palaeoptera. During the Permian, new insects Neopteran forms appeared. Blattoid and Orthopteroid orders attained their greatest diversity, and new groups like the Psocoptera, Homopteran, Hemiptera, Mecoptera and Coleoptera became ubiquitous and diverse. The Permian extinction wiped out nine orders of insects, and more orders disappeared in the Triassic or the early Jurassic. However, surviving orders such as Neuroptera, Mecoptera, and Diptera, and Coleoptera underwent further radiation establishing many families extant in modern times. From the Upper Cretaceous, insects have largely been of modern type. This is illustrated by the many recent families and genera that have been found preserved in Baltic amber and elsewhere. Of the orders recorded with certainty for the first time from Tertiary beds, the Strepsiptera and Siphonaptera may have been relatively late developments, but the others were probably more ancient. One of the sure signs that a fossil site is a Lagerstatt is when insects are well preserved. Insect preservation generally requires rapid sedimentary coverage before decay and predation occur. Liaoning is notes for its excellent insect preservation. Stromatolites are layered mounds, columns, and sheets found in the rock. They were originally built by the growth of layer upon layer of cyanobacteria, a single-celled photosynthesizing microbe growing on a sea floor. Cyanobacteria are prokaryotic cells (the simplest form of modern carbon-based life) that lack a DNA-containing nucleus. This simple organism was the only life on Earth for some 2 billion years, and dominated life on earth between 1 and 2 billion years ago. Though uncommon, extant stromatolites are found in a few places such as Shark Bay, Australia; the salinity of the water is very high in this bay, such that the only life that can survive is cyanobacteria. The prototypical structures are formed when the bacteria precipitate or trap and bind layers of sediment to make accretionary formations that present in different forms, including domes, cones and complex branching configurations. Structures sizes are highly variable from twig size to Mack truck size. Especially when polished, stromatolite can be most beautiful. Yet, interesting controversies persist in the origins of stromatolites. Among the fossil remains of extinct life on Earth, the trilobites are the most ubiquitous. In terms of popularity, they are probably second only to the dinosaurs. Trilobites were marine invertebrates that emerged in the Cambrian Explosion, a time that superimposed abundant oxygen on earth with the evolutionary emergence of cellular mechanisms to use oxygen for energy (see related article of cell biology). Diversity of life exploded and trilobites shared in the chain reaction. Trilobites rapidly evolved functional complexity and, particularly, sophisticated vision systems. Size, a relatively easy adaptation in evolution, also exploded. The entire Paleozoic Era is sometimes called the age of trilobites and for these 300 million years, trilobite evolution resulted in an estimated 15,000 different species exhibiting enormous diversity of forms most wonderful and beautiful. They vary in size from a few millimeters to a couple of feet. Trilobites have been called the "Butterflies of the Seas", a name we find most hard to dispute. Trilobites are members of the Phylum Arthropoda, which includes modern-day insects, scorpions, centipedes, shrimps, lobsters and crabs, and other jointed-legged animals. They lived throughout the crucial period just before the modern arthropod groups are known to have appeared. It is sound conjecture that trilobites descended from a single ancestor. But, by the time trilobites appeared in the Lower Cambrian fossil record, they were already a highly diverse and advanced sub-phylum of animals. Interestingly, Darwin thought trilobites most closely related to Crustacea, and the famous Walcott thought it was an arachnid. Setting aside one hypothesis in favor of the other yet alludes science. The trilobite was encased in an exoskeleton composed of calcite, a hard mineral, just like a modern-day clamshell. As an evolutionary adaptation that emerged in the Cambrian, exoskeletons served as a means of containment and support for internal organs. In fact, the appearance of exoskeletons in the Cambrian Explosion was undoubtedly a critical evolutionary innovation. In short, this support system was a prerequisite for an explosion of trilobite size. Natural selection would also have favored a development of harder and thicker shells due to the protection they provided. The trilobite evolved to be a veritable armored tank on the topside, but on the underside it was soft and vulnerable, and no currently living animals have such a configuration. Lengthwise, the trilobite is divided into three segments, the cephalon (or head), the thorax (middle) and pygidium (or tail). It may not surprise you that the organs contained in these segments correspond well to those of human head, middle and tail. The middle segment of the trilobite was further divided into a number of "thoracic segments", each connected fore and aft to adjacent segments by weaker tissue. These linked thoracic segments rendered the trilobite flexible, and hence more mobile, but also made them more vulnerable to predation. Trilobites particularly flourished in the oceans of the Cambrian and Ordovician periods, beginning around 540 million years ago, with a diminishing of families persisting until the Permian. The number of families actually peaked in the Late Cambrian when an extinction event removed many. The morphological diversity actually peaked in the Ordovician. 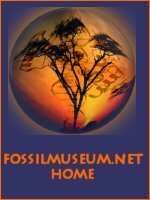 Many more families were removed at the end of the Ordovician 440 million years ago during a great ice age where ice sheets advanced to the equator. The diminished number of trilobite families that survived to the Silurian radiated into new and exotic forms, and still more exotic spiny and pustulose forms in the Devonian. The Devonian was punctuated by periods of rising seas that disrupted the reef systems where the trilobites flourished forcing selective adaptation. The end of the Devonian saw the Frasnian-Famennian event where only Proteus survived into the Carboniferous. Despite reduced ancestry, with decent with modification ruling, these trilobites filled the same ecological niches repeated the forms of their extinguished relatives. The genetic path was assuredly different, but the evolved forms had discernable specificity with those long extinct. However, trilobites never truly recovered in the Carboniferous, with but a handful of genera extant by the Permian. Failing to adapt to deep-water habitats, their vulnerability to climatic change remained and led to their disappearance prior to yet another great mass extinction at the end of the Permian. The age of the trilobite yielded to the age of the insect. Vertebrates are animals with backbones that comprise one subphylum of the phylum Chordata; the remainder of Chordata are the invertebrates that do not have backbones. Vertebrates encompass many of the familiar animals on Earth: birds; fishes; frogs; reptiles; snakes; and mammals, including we Homo sapiens. The vertebrate fossil record dates back some 500 million years ago to the upper Cambrian. Vertebrates first evolved in the ocean. The invertebrate ancestors of vertebrates had gill slits that were primarily used for filter feeding, with oxygen uptake being through their skin. These early vertebrates lacked jaws, as does extant hagfish and lampreys. Jawed vertebrates appeared 100 million years later in Silurian time. In terms of number of species, vertebrates are a tiny per cent of the living creatures.